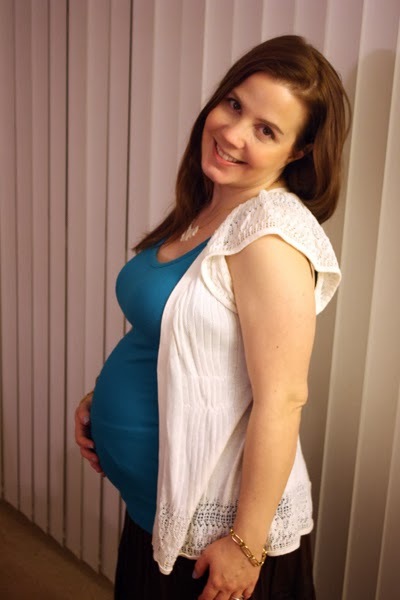 Well now I'm one day away from 25 weeks pregnant, but these photos were from 24 1/2 weeks. This past week we received our first gift off our registry from a dear friend who I haven't seen since high school! It was so sweet of my buddy Brendan to send something, and it was completely unexpected! 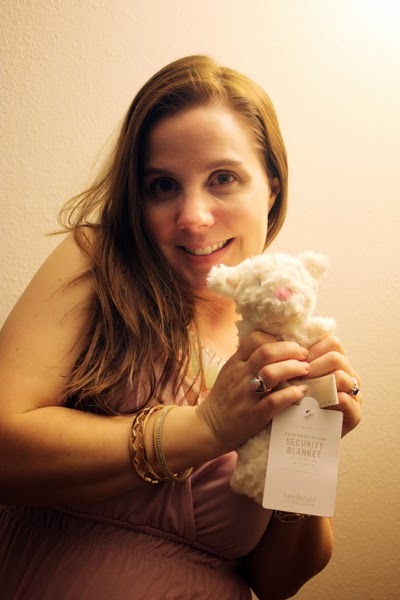 It's the sweetest little teddy bear security blanket from Restoration Hardware Baby & Child, and I LOVE it! It made my day to get it in the mail! Thanks, Brendan! Over the weekend, Mom came over and helped me start going through the "office" (which is just another name for dumping space/storage room at this point) to clear out space. The plan is to move all the items in the spare bedroom into the downstairs room so the now-guestroom will be the nursery. We made a lot of progress and I'm so glad I had my mom's help! She's the best organizer I know! Now I'm looking forward to visiting Illinois this week to see my family! Nick is bummed he won't be able to join me, as he has a lot to do here at home. My sweet sis-in-law is throwing me a baby shower with the help of my cousin, aunt, and stepmom. I can't wait! It will be so much fun and will be wonderful to see everyone! Here are my 24-week photos. As you can see, Nick finally talked me into lifting my shirt to show my belly for a photo. If I didn't feel this little girl moving and kicking all the time, I'd be convinced there was a basketball under my skin. I can't wait to see ya when you get here its been too long.